At just 16 years of age, we are proud to have David join the Deubel racing team on 2 levels. Not only did he take 1st place overall in the NSW State All-Mountain series for 2012, but he has also taken 1st place overall for the 2012 State Downhill Series and will be competing in the 2013 National Downhill Series riding the Prototype 2UP 7" conversion kit, which is fitted with a more downhill shock system. David's achievements include winner of the 2012 Australian Interschools MTB Championships and chaser of National downhill podiums. We are very excited to have David on board. 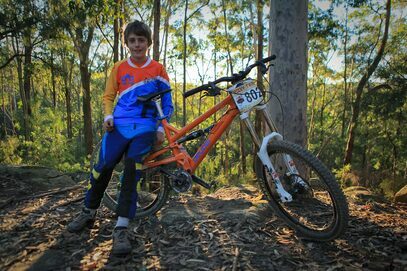 A very big welcome Patrick Butler to the Deubel Racing Team, for Downhill. As a 13 year old amateur rider, who regularly competes at the Hunter Mountain Bike Association in downhill events, Patrick started riding when he was 2.5 years old. His racing commenced in BMX when he was 6 and at the age of 7 did his first 8 hour cross country race. He started racing downhill at the age of 9 competing in various State/National series and various 4X and dual slalom events. 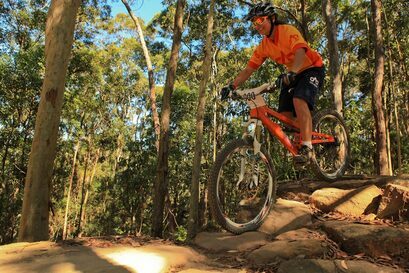 In Patrick’s words ‘I just can’t get enough of riding, especially now I am riding a Deubel bike. The 2UP is fast, quiet, light and corners really nicely. I just love bikes and dirt’. Patrick’s future goal is to one day compete in the downhill worlds. His achievements include 1st place in the 2013 All Mountain State Titles, 1st Place in the 2013 All Mountain State Series, 1st Place in the 2012 Paterson 24hr Junior Team, 1st Place in the Redass 4X and Dual Slalom Champs, plus loads more podiums. With already 1 podium under his belt in the Deubel Racing team, we look forward to many more achievements on the 2UP. Matthew joins the Deubel Racing team to compete in Cross Country events such as the Rocky Trail 7hr Grand Prix for the 2013 series. Matthew’s achievements started as a young boy in 1980 when he competed in the BMX Enduro & Cross Country event in Mid Wales, UK. The 1990’s saw him competing in what was the beginning of full suspension downhill racing in the UK, achieving top 10 scores for Youth & Junior. From 2005, Matthew took on Megavalanche finishing 48th, in 2008 he came 2nd in the Avalanche Enduro at Kielder Forest and for 3 years was #1 target man for UK North v South Mates DH series, which put him into the Dirt Magazine. 2009 to 2010 had him racing a 1 day 8,000m DH Enduro in France, an Alpine refuge DH Tour in Switzerland and a Fred Whitton Charity Sportive in the Lake District. He then relocated to Australian in 2011 where he competed in All-Mountain races coming in at the Top 5 in both Masters & Elite categories. We are proud to have Matthew on board and look forward to sharing his future achievements with the Deubel Racing team. Also known as Richard “Danger” Napper, he joins the Deubel Racing team to compete in Cross Country events such as the Rocky Trail 7hr Grand Prix for the 2013 series. Richard’s past has seen him dabbling into downhill, dirt jumping, cross country, road, BMX and all-mountain riding, basically a love of all things bike and dirt. Growing up in Canberra, his riding hot sports were of course Mt Stromlo, Majura and Melba BMX track whilst working at the local bike shop to bankroll vital equipment for his bike. 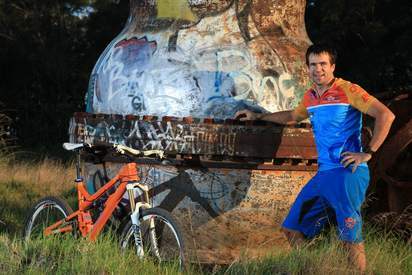 Richard’s major achievements include 1st Place in the 16kg bike category at the Turramurra Cycles Dirt Crit in 2005. 3rd Place in Sport Men category for the Downhill Australian Mountain bike championships in 2007. 2nd Place in Men’s single speed category for the Dirt works 100km Classic in 2007. 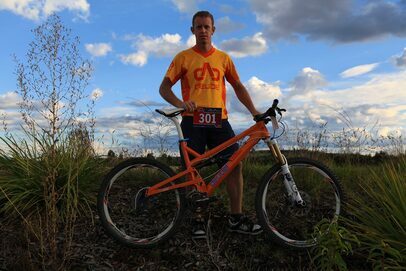 5th Place for the solo single speed at the Sydney Fat tire festival 8 hour in 2010, and 2nd Place in Expert category for the Rocky Trail Rollercoaster in 2012. In Richard's words “I’m stoked to be riding the 2UP for the Deubel Racing team. The bike suits an aggressive riding style and being Australian made, is a bonus”. We too are stoked that Richard joins the team. 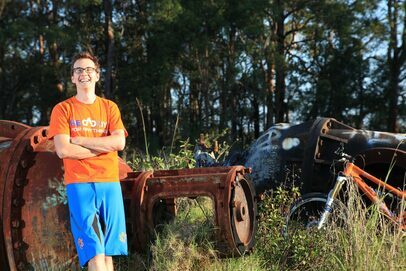 Swaggering onto the Northern beaches scene with only 2 years of riding experience to back him up, Brent “BDog” Dravitzki is living proof that you can take up riding at any age. Don’t let his lack of experience fool you... a misspent youth ragging on motorbikes has left this native New Zealander with an eye for dirt, which when coupled with a stubborn dogged determination, makes him a force to be reckoned with on the trail. Brent is thrilled to be representing the Deubel Racing team in the Rocky Trail 7hr Grand Prix. Battling a recent obsession to all things loam and strava related, he is looking forward to that next hit whilst charging on the 2UP and we are excited to have him on board. In his words “The quality Aussie engineering and brilliant adaptable design of the Deubel 2UP is pure stoke”. 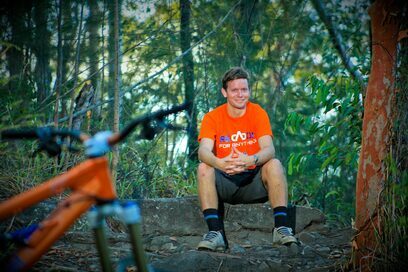 Mechanical Engineer and designer of the 2UP, Sebastien Deubel, raced the 2011 NSW State Downhill Series and came 2nd place overall in Expert category and 2nd place overall in the 2011/12 Australian Gravity Cup Downhill Series in Expert category on the 6" 2up All-mountain bike. He has also raced in 2011 in the Cross Country Shimano 4hr Grand Prix taking taking 1st Place in the Mixed Category. In 1998, Sebastien competed in the Megavalanche Championships, Switzerland taking 1st place in his category riding the very bike he designed at University. Gisella has joined the Deubel racing team purely for the fun of it and raced in the 2012 State All Mountain series in the womans category. She absolutely loves the 2UP and rides both downhill and cross country using the same bike and wouldn't ride anything else. 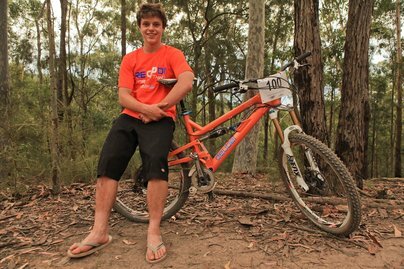 Marc joined the Deubel racing team in 2012 to compete in the 'Super D' at the 2011/2012 Australian All Mountain Cup taking 3rd Place overall for the series. Marc's major achievements include XC 2nd place in the Rocky Trail Entertainment 24hr Elite team and DH 4th overall in Expert category for the National Downhill series in 1996. We are very pleased to have Marc on board.